New Book, Cat Wars, Looks At What To Do With Free-Ranging Cats : 13.7: Cosmos And Culture A new book — and an extraordinary backlash to it — has put poison, predator cats and at-risk wildlife front and center, says anthropologist Barbara J. King. 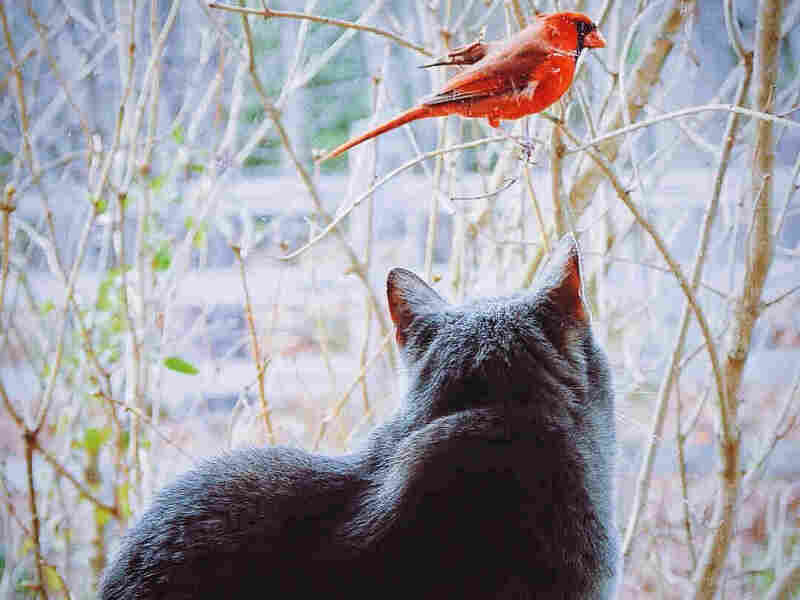 Are free-ranging cats pint-size murderers who need to be removed from the landscape because they critically decrease bird and small-mammal populations? Or is the estimation of free-ranging cats' impact on birds exaggerated, so that we'd do better to rein in the anti-cat hype and to focus on our own actions toward wildlife? Are these the only two possible positions? Or is this dichotomy itself a kind of hype? These questions aren't new, but they've heated up again this month thanks to Peter P. Marra and Chris Santella's book, Cat Wars: The Devastating Consequences of a Cuddly Killer. Cat Wars has garnered significant attention for its claim that free-ranging cats — ferals and strays and pet cats allowed to go outdoors — kill birds and small mammals in such enormous numbers that they themselves should be trapped and/or killed by "any means necessary." "While individual pet owners must take responsibility for their cats, it is everyone's responsibility to address the challenges of managing free-range cats to limit their impact on wildlife, both as predators and vectors of disease. From a conservation ecology perspective, the most desirable outcome seems clear — remove all free-ranging cats from the landscape by any means necessary." "But such a solution is hardly practical given the legions of cats roaming the land — as many as 100 million unowned animals, plus 50 million cats that roam — and the painful question of what to do with the cats even if they could be captured." So what exactly do Marra and Santella intend? A little more background first: As Katie Lisnik, of the Humane Society of the United States, notes, their "by any means necessary" language has led Princeton University Press to issue a statement avowing that the authors don't support inhumane treatment of animals. That's extraordinary in itself. And let's be clear: I'm the sort of person that Marra and Santella explicitly charge with being part of the problem because for years my husband and I have fed and cared for feral cats. We now live with six rescued cats who never go outdoors, and we care for eight more feral cats who reside entirely in a shaded-and-sheltered outdoor enclosure in our back yard — plus a ninth outside cat who (after a failed attempt to enclose him) roams freely. I'm a cat advocate and, at the same time, I care about the lives of birds and other small wildlife. Marra and Santella are right to say that cat caretakers need to do all we can to minimize cats' predation on local wildlife. Cat Wars is, though, problematic for me because it recommends that some feral cats should be killed, including by drastic measures, and it roots this conclusion in the claim that science shows that cats are an extinction-level threat to birds and other small wildlife. In fact, in the contiguous United States, Marra and Santella say, cats kill between 1.3 billion and 4 billion birds annually. "The phrase 'by any means necessary' is among the most reprehensible statements I've ever seen, and of course, in addition to it being morally repugnant, it is not based on science and it won't work." "The fact is, the best estimates available suggest there are only 3.2 billion land birds in the entire country. Were the authors' estimates even remotely accurate, birds would have vanished from the U.S. long ago. This was, in other words, classic junk science." "As evidence of the 'clear message' that cats have a negative impact on bird populations, for example, Marra and Santella refer to a study done in Sheffield, England — ignoring the evidence that blackbirds, the species alleged to be under threat, are actually increasing in abundance across much of the U.K., with declines observed only in London, and due not to predation but 'a lack of insects and other food.' "
"Marra, Santella, and their supporters violate basic tenets of scientific reasoning when making their claims about outdoor cats. They do so by overgeneralizing the findings of specific, local studies to the world at large. In terms of logic, this involves both the fallacy of composition (all the world is like the part where cats and wildlife have been studied), and the fallacy of hasty generalization (if cats are a problem for wildlife in this place, then they must be a problem in every place). There are simply too many variables to warrant their alarmism — the vastly more important human depredations on biodiversity, the diversity of ecological contexts in which cats are found, and differences in cat personality and behavior." This topic is complex. For example, I have no clear idea how many birds are in the U.S. and available to cats. I do know this: It's not a war against cats that we need. We should slow down, critically review the assumptions that underpin the science, and resist panicky, dire recommendations. TNR — a program favored by cat advocates whereby cats are trapped, neutered (or spayed) and returned to the community — isn't a failed practice, as Marra and Santella charge. As the advocacy organization Alley Cat Allies says, given appropriate resources and community commitment, it may be quite effective. "[Cat Wars] is rooted in a worldview that trivializes the value of individual animal lives. This is the shame of traditional approaches to conservation and wildlife management — a pre-commitment to killing our way back to biodiversity that is nothing but bloodsport writ large." We should work hard to protect birds and small wildlife, and, as part of that project, to reduce free-ranging cat numbers. This can be done across the generations by population-control measures, not with poison and bullets aimed at living cats who deserve our empathy and care.